Forget everything you saw regarding the Alec Bradley Post Embargo cigar brand at the IPCPR trade show last summer—the packaging has completely changed. Although the cigars are rolled and ready, brand owner Alan Rubin scrapped the entire star-spangled Americana motif and redesigned the boxes and bands from scratch. Now, it shows allegorical representations of Cuba and America with classic artwork resurrected from a vintage Cuban brand. "The original boxes ended up looking like a toy. Too cartoonish. I couldn't do that to the brand," said Rubin to Cigar Insider. 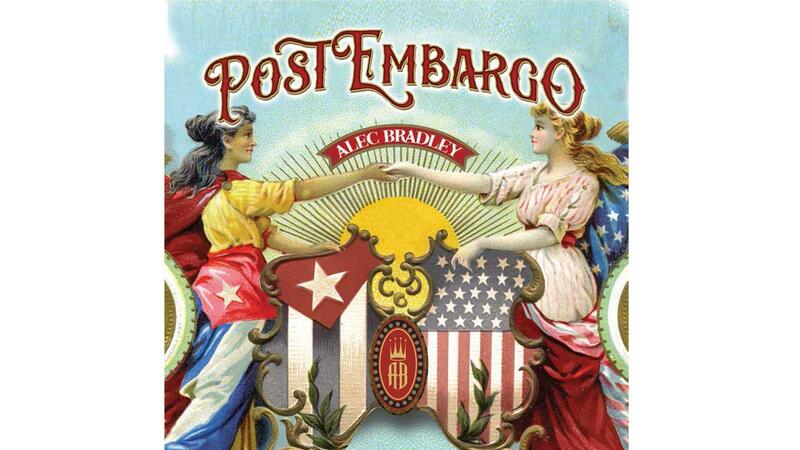 Post Embargo's forward-thinking theme celebrates the United States' improved diplomacy with Cuba. First previewed at the 2015 IPCPR trade show in New Orleans, the cigars were presented in a large, wooden shipping crate with bold, eye-catching artwork on the band that appeared to represent the marriage of the Cuban and American flags. At the show, Rubin indicated that the band and packaging were not finalized and would likely change before Post Embargo's official release. The cigar's artwork has now been overhauled, and features two women (one from Cuba, one from the U.S.) draped in their country's respective flags, clasping hands. "I welcome the dropping of the embargo," Rubin said. "I hear the term ‘non-Cuban cigars' and it bothers me. It's as if Cubans are the benchmark and everything else is second-rate. When the embargo ends, we'll all be on a level playing field, and I'll be able to compete with Cuban brands. I want people to smoke my cigars next to Cuban cigars. That's what Post Embargo is really about—open trade and a level playing field where the smoker can make his choice without being influenced by the mystique of the unattainable." Naturally, the change caused a delay in the release date, but Alec Bradley Post Embargo will start reaching retailers this month and is slated to launch on November 11 at a series of events at Cigar Cigars, a chain of cigar retail stores located throughout Pennsylvania. Post Embargo features a Honduran wrapper, two binders from Nicaragua and Honduras, and a filler blend of Nicaraguan and Honduran tobacco. The line will have suggested retail prices from $8 to $9.25. There are four sizes: Robusto, at 5 inches by 52 ring gauge; Toro, 6 1/4 by 54; Gordo, 6 by 60; and a limited-edition Lancero, at 7 1/2 by 41. Only 1,000 boxes of each size have been produced, with the exception of Lancero, with only 500 boxes. The cigars ship in boxes of 20 and are made at Fabrica de Tabacos Raices Cubanas S. de R.L., in Honduras. For more on the Alec Bradley Post Embargo see the November 3, 2015 issue of Cigar Insider.